This paper gives a thorough two-part overview of the wood and wood products sector in the Central and Eastern European countries (CEECs), including Bulgaria, the Czech Republic, Hungary, Poland, Romania, Slovakia and Slovenia. The first part provides a macroeconomic analysis of the development and prospects of the sector, based on the WIIW Industrial Database Eastern Europe, while the second part presents further information on sub-branches as well as on company profiles of selected domestic and foreign enterprises. The goal of the paper is to look at trends in growth and structure of the sector, both in terms of production and employment, to analyse factors of international competitiveness, to present various aspects of trade performance with the European Union and to take a look at foreign direct investment, from the macro-side and from company case studies. 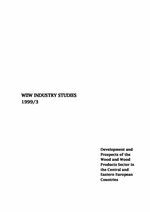 This paper shows that the wood and wood products sector in the Central and Eastern European countries plays only a minor role in total manufacturing output and employment today -- but still has a larger weight in these countries as compared to Western Europe. Going through the transformational recession, the sector could not ward of its decline in the domestic economies -- although it has an above-average export orientation and is of major importance as a net exporter in all CEECs. Only in Poland, manufacturing displayed an increasing specialization on the wood and wood products sector.